Cordwainer Smith is the pseudonym of Paul Myron Anthony Linebarger. He also used "Carmichael Smith" (for his political thriller Atomsk), "Anthony Bearden" (for his poetry) and "Felix C. Forrest" (for the novels Ria and Carola). 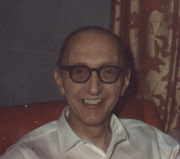 Cordwainer Smith, The Best of Cordwainer Smith. Cordwainer Smith is currently considered a "single author." If one or more works are by a distinct, homonymous authors, go ahead and split the author. Cordwainer Smith is composed of 18 names. You can examine and separate out names.